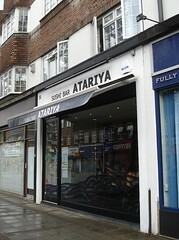 Atari-Ya was a sushi bar in Hendon, associated with the Atari-Ya chain of Japanese fishmongers. It closed down in June 2016. Another opening from the Atari-Ya chain of Japanese fishmongers, this is a full-fledged sushi bar in Hendon which opened in Autumn 2008. Inside, the decor is clean and simple. The sushi bar runs along one side of the narrow room, with eight or nine stools. Table seating for 18 people is opposite, with a long banquette along the wall and blocky pale wood tables and chairs. The tables can be moved left and right to provide seating for groups of two, four, etc. Kake first visited on a Wednesday lunchtime in September 2009. There were about half a dozen other customers when I arrived, so no problem finding me a table. Music was playing, some radio station or other. Tea arrived mere seconds after I sat down, and was refilled as necessary. The only menu I was given was the set lunch one, from which I chose the sashimi set lunch (£9.50). Pickles and miso soup arrived first; both were good. Next came a salad of mixed green leaves in a decent enough dressing, tangy but not sharp. The main event comprised a bowl of rice (good, firm grains, not overcooked or mushy) and twelve pieces of sashimi photo; scallop, surf clam, salmon, yellowtail, and lean tuna. All the fish tasted fresh, and was well-cut. The scallops in particular were the freshest I've tasted in a while, and it was very good to see yellowtail cut to a decent thickness rather than the thin slivers some places try to get away with. Kake and Ewan visited again on a Thursday lunchtime in August 2013. It was a very warm day, so we were relieved to find they had the aircon on. Shared starters of agedashi tofu photo and spinach ohitashi photo were both good; the tofu was good quality tofu, competently fried, and the spinach had plenty of umami flavour, helped by the generous quantity of bonito flakes on top. Kake's sashimi set lunch was much the same as the previous time, though prices had increased in line with inflation and the scallops had been replaced with some form of white fish, possibly seabass. Ewan had the chirashi set lunch, which included chirashi sushi photo as well as chilled udon photo, salad, miso soup, and pickles. Tea was again automatically provided and topped up, and we were also given a small savoury appetiser photo before the meal and a few pieces of fruit afterwards; none of this appeared on the bill. Kake's verdict: Atari-Ya offers possibly the best quality-to-price ratio you'll find in London. I made the journey up to Hendon specifically to have lunch here, and I'd do it again. They have another sushi bar on James Street in Marylebone, which gets more crowded but is probably more convenient for many people. Accessibility: One step to get in. No further steps once you're in, including to the toilets. Last visited by Kake and Ewan, August 2013. Last edited 2016-11-27 14:58:12 (version 9; diff). List all versions. Page last edited 2016-11-27 14:58:12 (version 9).